The Polycom Soundstation IP 7000 was for many years the conference phone of choice at OnSIP. We used it every Wednesday for our engineering meeting and every Friday for our all-hands meeting. Since we have many remote employees in various locations across the country (and at times, in other countries), it's essential that everyone can join a conference call with reliable sound quality. In this phone review, we take a look at how the Polycom Soundstation IP 7000 conference phone has held up over the years. Read on to learn about its features, audio range, sound quality, and more. The Soundstation IP 7000 is the most advanced open standards conference phone still produced by Polycom. Though the phone is nearly a decade old—having been introduced in 2008—it still holds up when compared to similar devices from other manufacturers. Using a Polycom Soundstation IP 7000 at the end of 2017 shows the age of the device. The amenities list is not flashy. 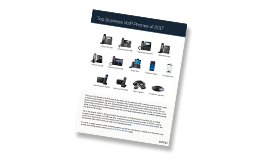 It still sports a black and white LCD display, while many other manufacturers have moved on to full-color touchscreens, as the ubiquity of smartphones has influenced desk phone UI. Everything is controlled through physical buttons. The keys are well laid out and have a nice responsive springiness and satisfying click when pressed. The Soundstation IP 7000 is good for small to medium conference rooms. The only reason we no longer use this device as our primary conference phone is that we’ve outgrown the time when we could all sit around one table. It’s possible to purchase expansion microphones for the Soundstation or to link multiple phones to act as one unit, but it’s not something we’ve tried here. The 7000 states that it has a pickup range of about 20 feet, but we found that anything past 10 feet became unclear in our usage. The sound quality on the Polycom Soundstation IP 7000 continues to impress us, even when compared to other manufacturers’ more recent devices. Although the codec list has gone on to include various Siren and L.16 implementations, the 7000 does not yet provide Opus, whose ties to WebRTC would make it an excellent addition to the phone’s sound suite. The microphones are able to pick up and translate voices quite well, even when in an environment with steady background noise. The speakers produce a clear, clean sound and very lifelike reproduction of the human voice. Like all Polycom phones, we have no issues with interoperability with the Polycom Soundstation IP 7000. The phone makes both blind and attended (“consultative” in Polycom’s parlance) transfers without issue, makes use of OnSIP’s various apps without issue, and provisions perfectly with our provisioning server. 1. Gather information for each user. 2. Log into your Polycom phone through a web browser. When your phone is powered on and connected to your LAN, use a web browser to navigate to your phone’s IP address. 3. Enter your user credentials from Step 1. For most setups, you will need to configure "Simple Setup." If you are trying to configure multiple users or multiple line appearances, you can repeat the steps below for each of the identities you are configuring. You can insert boot.onsip.com as the provisioning server to save time on provisioning. Your Polycom Soundstation IP 7000 is now ready for use. The Polycom Soundstation IP 7000 is an excellent conference phone when compared to other models on the market. It has top-of-the-line sound quality, proven SIP interoperability, and excellent physical durability. If you’re looking for a high-end device for your small to medium-sized conference room, this is a solid choice. The only bit of caution we’d add is that at nearly a decade old, there is the chance that the Soundstation IP 7000 could be discontinued sooner than other phones on the market. While Polycom has been content to explore other conference solutions recently, there’s no telling when they may decide to release the next generation of Soundstations to take advantage of what they’ve learned since introducing this device.